Against this backdrop students held a rally on campus in support of the removal of monuments to Confederate leaders. 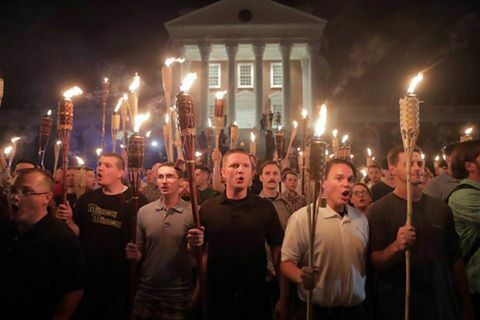 Nearly 400 neo-nazis, mostly young and dressed in polo shirts and khaki pants, marched up by torchlight chanting “white lives matter” and “seig heil” while giving stiff armed nazi salutes. As the included video from the activist media collective Unicorn Riot (www.unicornriot.ninja) shows they then began and unprovoked pepper spray attack on the students and then began beating them. The nazi march was unannounced and had no permit of any kind, unlike dozens of marches against police brutality and Trump's Muslim ban around the country and in Columbus that are halted with batons and pepper spray. Police did not intervene until late and only one arrest was made. The mainstream press reported the event as a “scuffle” and fed the narrative of moral equivalency of anti-fascist protestors and actual fascists, which has been the liberal talking point as of late inside the beltway. The ACLU sued on behalf of the fascist march today retaining it's permit and that march will be protected by over 1000 police and national guardsmen in the largest law enforcement mobilization in the history of Virginia. The ACLU has not issued a statement on behalf of the free-speech rights of students on their own campus attacked under torchlight by neo-nazis in a scene designed by the latter to evoke images of 1930s Germany. The ACLU only filed three suits in recent memory over the Free Speech rights of black lives matter demonstrators, and only after an incident of police brutality. That is the same number of suits they have launch preemptively in support of neo-nazis in same number of months. At the time of this news brief, activists are on the ground in Charlottesville preparing to face another round of police protected neo-nazi terror. Already the fascists have moved through police lines to attack counter protestors including clergy, apparently with the ACLU's blessing on their free speech rights. Those events will be re-capped here as they can be verified.